Diahelse (Diabetes Health) is a healthy lifestyle service for immigrant women who are either diabetic or in danger of being so. It is specifically tailored towards those who don’t speak or understand Norwegian, and who come from culturally different backgrounds. In designing an inclusive, low-threshold solution, we helped patients gain a greater understanding of how they could adjust their lives accordingly. Diabetes is an increasing public health issue. 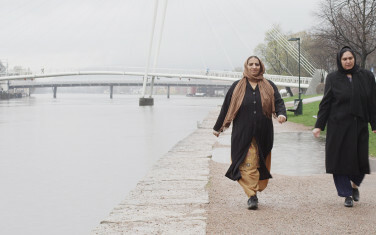 Norwegian government studies showed that the disease in Norway particularly effects women from countries such as Asia, Africa and Latin America. Due to various cultural differences, the challenge for most health care professionals is recruiting, motivating and including this group of women in any healthy living programmes. 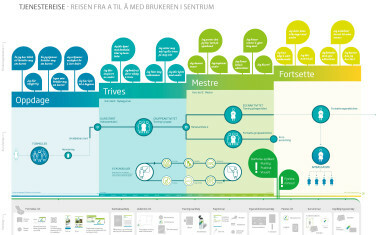 Therefore in 2010, The Norwegian Health Directorate and Norsk Form organised a National Design Competition inviting designers to devise a practical proposal for Drammen Municipality (Fysioteket) and Vestre Viken Hospital Trust, which EGGS won, along with Blue Room Design and Innovativoli. Through the assistance of interpreters, as well as various visual aids we began by conducting a series of activities that allowed us major insight into the needs of such a diverse user group. Among the various methods we initiated were participant observation on existing training programmes and in-depth interviews with a large number of immigrant women. We also held interviews with health care experts and professionals within the community. Our key objectives were to identify suitable channels for the recruitment of willing participants, gain insight into the potential hurdles for taking part and to help motivate patients into making any necessary lifestyle changes. Diahelse tone-of-voice: oral, practical and visual. 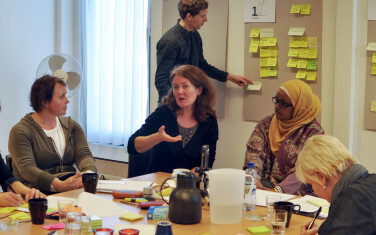 The result was a four-step training programme with a strong visual identity and associated tools for participants, trainers and other key personnel involved. For a target group with such major language difficulties, all graphic design is based on universal design principles with bold contrast, large font and clear readability. The overall communication form, to ensure good interaction with the participants, is characterised with three principles: oral, practical and visual. The programme creates a safe and comfortable environment through education, social activities and networks. Participants are invited to be open and encouraged to share their thoughts, in addition to thinking long term towards promoting sustainable well-being, whilst coping with their circumstances. In 2014 Diahelse was evaluated and gained positive critical acclaim. The health service has triggered important behavioural change with the health care professionals who have incorporated the Diahelse tone-of-voice as well as substantially increased the use of interpreters increasing the quality of communication when dealing with patients. Feedback suggests that many participants had learned a great deal and therefore had not only made significant healthy alterations to their lives, but more importantly continued to do so. This effective example proves how detailed user insight is pivotal in the understanding and successful implication of service design, and how users can thrive and benefit from it.